The fundamental rights are enshrined under Part III of the Indian Constitution. 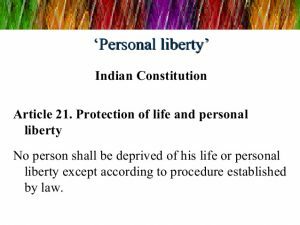 Article 21 of our Constitution deals with “Protection of Life and Personal Liberty” and is one of the important fundamental rights among many. It states “No person shall be deprived of his life or personal liberty except according to procedure established by law”. The object of the fundamental right under Article 21 is to prevent any restriction by the State to a person upon his personal liberty and deprivation of life except according to procedure established by law. According to this article right to life means the right to lead a meaningful complete and dignified life without any restricted meaning. Now, the question whether right to life under Article 21 includes right to die or not came for consideration for the very first time before the Bombay High Court in State of Maharastra vs. Maruti Sripati Dubal and consequently was held that the right to life guaranteed under Article 21 includes right to die, and the Hon’ble High Court struck down section 309 IPC which provides punishment for attempt to commit suicide by a person as unconstitutional. In P Rathinam vs Union of India, a Division Bench of the Supreme Court supporting the decision of the High Court of Bombay in Maruti Sripati Dubal case held that under Article 21 right to life also include right to die and laid down that section 309 of Indian Penal Code which deals with ‘attempt to commit suicide is a penal offence’ unconstitutional. The issue is again raised before the court in Gian Kaur vs. State of Punjab. In this case a five judge Constitutional Bench of the Supeme Court overruled the P. Ratinam’s case and held that “Right to Life” under Article 21 of the Constitution does not include “Right to die” or “Right to be killed” and there is no ground to hold that the section 309, IPC is constitutionally invalid. 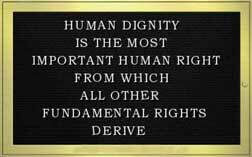 To true meaning of the word ‘life’ in Article 21 means life with human dignity. Any aspect of life which makes life dignified may be included in it but not that which extinguishes it. The ‘Right to Die’ if any, is inherently inconsistent with the ‘Right to Life’ as is “death” with “Life”. A question may arise, in case of a dying man, who is seriously ill or has been suffering from incurable form of disease he may be permitted to terminate it by a premature extinction of his life in those circumstances. 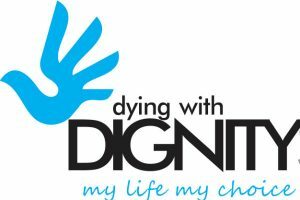 This category of cases may fall within the ambit of “Right to Die” with dignity as a part of life with dignity. According to the court these are not cases of extinguishing life but only of accelerating the process of natural death which has already commenced. Last week, in Common Cause vs. Union of India, Supreme Court ended the debate once and for all by upholding the practise of passive euthanasia the removal of life-support mechanisms from persons who, for the most part, have slipped into a persistent vegetative state in order to allow them to die in the natural course of things — and laid down a set of detailed procedural guidelines to facilitate this process. 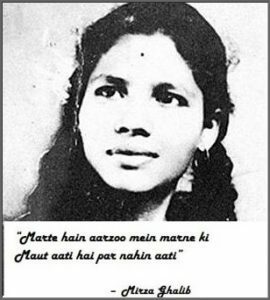 Now most of you, if not all, are already aware of the term euthanasia which became a rage in 2011 when Aruna Ramachandra Shanbaug who had been lying in a PVS in the KEM Hospital in Mumbai for 37 years was allowed passive euthanasia by the Supreme Court which dismissed the petition of her friend Pinky Virani of Bombay seeking mercy killing for Aruna. Voluntary Active Euthanasia: When a physician administers a medication, such as a sedative and neuromuscular relaxant, to intentionally end a patient’s life with mentally competent patient’s explicit request (Applicable in India). A five-judge bench of the apex court headed by the Chief Justice of India Dipak Misra and comprising Justices A.K. Sikri, A.M. Khanwilkar, D.Y. Chandrachud and Ashok Bhushan, upheld passive euthanasia. Passive euthanasia is the act of withdrawing or withholding medical support to a dying patient who has no hope for revival or cure. The apex court also issued guidelines in recognition of “living will” made by terminally-ill patients. These directives are instructions issued by a person specifying what should be done to her in the event of a terminal illness, and who will decide if she herself is incapacitated from giving or withholding consent. The court also addressed situations where a patient was terminally ill, but had not issued an advance directive. In case where a patient who is terminally ill but has not issued an advanced directive, the consent of the patient’s close family, subject to the supervision of and concurrence by trained medical personnel, would substitute for the advance directive. The Supreme Court’s verdict on legalising passive euthanasia is a step that will help people in an incurable vegetative state or deep coma a chance to breathe their last in peace and dignity. Even though it is the duty of kith and kin to do their best to save the life of the person, or would be uncharitable to expect them to be providing life support to one who as per medical parlance is already dead. But stringent guidelines need to be on place to prevent misuse. 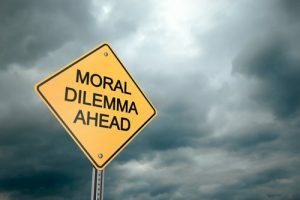 When critical care gets far too critical and patients can’t endure it any longer, families are caught on the horns of the dilemma. They can neither exercise the moral right to suspend treatment nor afford the mounting cost of health care. Aside from such expenses, the patient is subject to unending torment from a plethora of medical instruments to keep him alive. In such dire circumstances where patients are reduced to a vegetative state, it becomes incumbent on others to let them die peacefully through a living will or passive euthanasia.